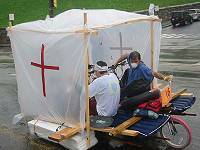 Baltimore Kinetic Sculpture Race: Build your own entry! Are You Crazy Enough To Build One of these Things? The first thing you need to realize is that it is not easy to build a sculpture—so be impressed! Almost every year there are some entrants who discover just how hard it is to build a robust human-powered amphibious vehicle because they experience some sort of catastrophic breakdown. And once you build the sculpture, you need Kinetinauts who have the physical stamina to propel the contraption for 15 miles! Join the Mailing List for Kinetinauts for notification of deadlines and other things of interest to Kinetinauts. Station North Tool Library has an inventory of nearly 1,700 tools, classes on tool use, safety, building stuff, and Open Shop time in the Public Workshop (project storage is not provided). Kinetic Sculpture Racing Course from Brandon Emmons of the Jemicy School is an excellent tutorial of propulsion, steering, and buoyancy. The site also includes sample plans for building a sculpture. How to Build a Kinetic Sculpture by Elliot Naess, who has succesfully completed the World Championship race many times. The World Championship in Humboldt is more grueling than Baltimore’s race, so it’s a bit easier to succeed here. Instructable for building a 3-wheel bicycle-component sculpture written by the creator of 2015’s Guppy. Department of Spontaneous Combustion: Berserker has how-to details. Have You Got the Right Stuff? is AVAM’s Kinetinaut and volunteer recruitment flyer. Read others’ questions and answers—and post your own—on the Kinetic Forum. You’ll probably need someone who can braze—or better yet—weld. The structure needs to be held together strongly in order to survive the race. While it may seem a lot easier to assemble a frame out of PVC pipe or lumber, the frames of sculptures that make it to the finish line tend to be made of brazed or welded metal. Test! And test some more! Frank Conlan and Peter Stern’s team of Make Believers builds some of the best innovative sculptures each year. In 2002, they had a novel stair-stepping propulsion technique on their DeVine Stompers sculpture. In 2003, they built the Teapot, and in 2004 the Cirque de Sore Legs train. Fabulous art combines with very effective engineering with that bunch. Even then, the Cirque experienced the most exciting mishap in years of racing when it was blown off course and broke apart while being towed by the Baltimore Police. These guys are the best, and still have unanticipated excitement. So if you’re building a sculpture for the first time, you must test it thoroughly, because you don’t want to be one of those sculptures that breaks down in the first hundred yards of the race! Wear Costumes! Outfitting your pilots and crew with costumes that match your sculpture’s theme is essential in creating a spectacle. Don’t forget your helmets—giant pieces of meat, huge sombreros, or some other thematic enhancement to your bike helmets will make a huge contribution. Work the Crowd! Spectators love to join in. Especially at the water entry, one of your crew can encourage the crowd to cheer along. If we have room, the Spectator’s Guide can include a cheer that you provide on your application form or send to us at KineticBaltimore.com. Plan any surprises carefully! Some teams like to surprise the crowd with a dramatic flourish—like when the It Cain’t team transformed their Titanic Ocean Liner into a rowboat on the water in 2005. You can surprise the crowd, but be sure to tip off the media so the surprise can be documented. You can email us here at KineticBaltimore.com, include a note about where your surprise will occur on your entry form, or at least send a member of your pit crew around to notify all nearby media a few minutes before you do it. 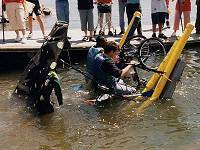 2001: These guys drove into the water at the Canton loop and immediately sank. Their flotation relied on a little bit of gray styrofoam and some long yellow PVC tubes. But the tubes were simply tied with twine, which was clearly not up to the hundreds of pounds of force they were about to face—horizontally. The tubes shot forward, and the rear of the sculpture sank like a stone. Lesson #1: Be sure everything is held together solidly. Twine does not count. Lesson #2: Be sure to test your sculpture in all terrain. Really test. 2002: This sculpture had an artistically clever design—a cow with a configuration like a Conestoga wagon, and hinged cow legs to look like it’s galloping. Bicycle wheels without tires perhaps seemed a good idea in the design stage, because they look slightly more like wooden wheels. However, less than halfway through the race, I saw two exhausted Kinetinauts struggling to keep the cow going. Amazingly, they explained that they had started the race as mere spectators, and that the original Kinetinauts who designed the sculpture had gotten so worn out that they had abandoned it to them! These recruited Kinetinauts were already tired and tried to recruit us. 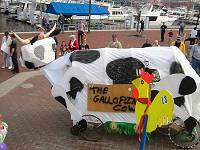 But The Galloping Cow actually made it across the finish line, with conscripted Kinetinauts! Lesson #3: If you start with an existing concept (like a bicycle)—and you probably should your first year—don’t remove any features (like tires) without understanding why they’re there. Lesson #4: Never give up—even if you have to recruit strangers to drag your sculpture to the finish line. Lesson #5: As a spectator, you never know what you’ll be called on to do. 2003: A reprise of Lesson #1 from above, with styrofoam and air mattresses that aren’t held together as securely as they might be. But in true innovative fashion, these guys designed their sculpture so they were riding backwards through the race. But despite this questionable design choice, they finished! They won the Next-To-Last award, but they finished! Lesson #6: The race is 15 miles. Imagine piloting your sculpture all day. Lesson #7: Never give up, even if you have to drive backwards! You can do it! 2004: Louie the Dog was out for his second year through the course, a first-class veteran, and was making mincemeat of the competition without breaking a sweat. Then he got into the water at Canton. Some extra weight added since last year really got to Louie; he started sinking on one side. (See the Pontoon Effect footnote at the bottom of the 2005 Race Description. Left to his own devices, Louie would have probably inverted himself, upside down and completely under water. Louie is proof that it’s possible to win the Engineering Award one year for an incredible design, and the next year to win the Golden Flipper Award for almost capsizing! Lesson #8: Past performance is no guarantee of future success. Lesson #9: If you don’t make physics your friend, it may be your enemy. 2005: The Galloping Cow Rides Again. A picture is worth a thousand words. Lesson #10: Tis better to race and capsize than never to race at all. 2006: Subdude had a paddlewheel, but it was completely under water—thus useless. Lesson #11: Paddlewheels require precise calibration to ensure they’re submerged just enough but not too much. Be sure to test the sculpture with the same amount of weight on board you will have during the race. 2007: Kinetic Airways suffered a drivetrain failure trying to drive out of this pothole. Without a pit crew or spare parts, it couldn’t finish the race and was brought to the end of the race in a trailer. Lesson #12: Have a pit crew. Lesson #13: Have spare parts. 2009: In a Mexican restaurant, tacos are good. 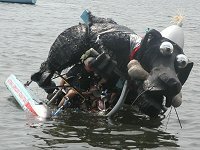 In a Kinetic Sculpture Race, they’re often doom. Bicycle wheels seem ideal for Kinetics—but it’s quite easy to overload them laterally. When you apply too much lateral force, they bend like a taco. Each year, at least one sculpture tacos a bicycle wheel. You almost certainly won’t have the tools to de-taco a wheel with you, so finishing the race may depend on having a spare wheel or two. Lesson #14: Try to avoid over-stressing your components, especially wheels and brakes. Lesson #15: Bring spare wheels, ready to be installed.